It is hugely satisfying to see the fine book in its Oxford University Press critical edition garb. 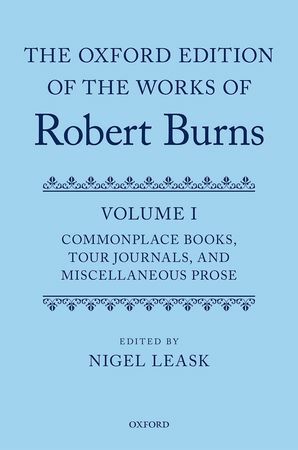 Prof Nigel Leask’s volume is the first in our ‘Oxford Edition of the Works of Robert Burns’, to be joined over the next decade or so by around another 10 volumes. As General Editor, I signed the initial contract with the Press in July 2008, and in 2011 we won for the edition a massive 5 year major research grant from the Arts and Humanities Research Council which has enabled us to be where we are today. Good things take time and our first volume is a mature landmark full of Nigel’s excellent scholarship supported by a team of other scholars. Commonplace Books, Tour Journals and Miscellaneous Prose has much familiar material – Burns’s stravaigings around the Borders and the Highlands, the Glenriddell manuscript and letters to the press – but none of it as fully annotated and edited previously as here. More to come in 2016 and in 2018. Click here to view the Oxford University Press catalogue entry for the volume.